Going Commando | A SWTOR Fan Blog: 400 Posts! It's that time again... time to celebrate another blogging milestone, this time my 400th post on here (namely this one)! As has become a tradition, I shall use this as an opportunity to dig up some search terms that have led people to this blog since my last milestone. Before I get to that part though, I have to say that Google Analytics is a strange beast. It disagrees wildly with Blogger's internal metrics on how many page views I get a day, so I wouldn't even dare to guess how many readers I actually have. What is interesting however is that GA shows very little variation in my site's popularity over the past year. Sure, the line zig-zags a bit due to variations in daily page views, but overall it's remarkably straight. Could this be a hint that interest in SWTOR is also fairly consistent? Who knows. Now, onwards to the search terms! First off, random Q&A time! can group flashpoints on ilum be done as a solo - I wouldn't recommend trying to do so at level (50), but considering that we can level up to 60 by now, soloing these at cap should be easy-peasy. how can i tell how manny datacrons ive got so far in swtor? - Sadly the only real way of telling is based on the related codex entries (under achievements - datacrons), except for the datacron on the fleet that gives +10 to all stats. That one doesn't have an associated codex entry, so good luck with remembering which of your alts have it and which ones don't. For the rest I've bookmarked this handy Reddit thread that lists which datacrons correspond to which codex entries. It's just missing the new Rishi ones, whose codex entries have the numbers 90-93.
if you send away companion no - affection - Unfortunately yes, you will only gain or lose affection if your companion is actually present while you make choices. Except sometimes it bugs out in flashpoints and you'll randomly gain or lose affection with whichever companion you had active during the whole thing, even if they were never actually present inside the instance. swtor assault on korriban where do u find 4th conquest commander - They are pretty hard to miss actually: the first one is to the right just after you jump down the hill where you spawn in, then about halfway down the valley there's one to the left and one to the right, and the last one is right in front of the last boss. The reason this question jumped out at me was that I had that flashpoint bug out on me once and asked myself the same question... as far as I could tell my group had killed absolutely everything in sight, yet our progress was stuck on 3/4. We eventually just had to disband and requeue. Sorry if that happened to you too. swtor how to spam in general chat - I... no. Just no. swtor supreme chancellor's personal guard? - They look pretty funky, don't they? I believe they are wearing the original Battlemaster gear for troopers, recoloured in yellow and blue. swtor why is there a rakghoul vaccine at all the venders on taris should i buy some? - I thought this was a very sensible question, which has a disappointingly mundane answer. No, you don't need to buy rakghoul vaccines while questing on Taris. For all the dire things the NPCs tell you about the dangers of the rakghoul plague, in practice the 'ghouls won't give you anything worse than some temporary debuffs. The vaccines are for the rakghoul resurgence world event, where mobs on the infected planet as well as other players can spread a different version of the plague around (against which the vaccine protects)... and that version is actually seriously annoying if you just want to play as normal. what is the beam of green that comes out of commandos swtor - When a Commando loves another player very, very much... they'll shoot green lasers out of their assault cannon to heal that player. Honestly though, what did you think it was? swtor gold seller joke - Two gold sellers walk into a bar. One says: "Buy gold!" The other says... Sorry, I got nothing. 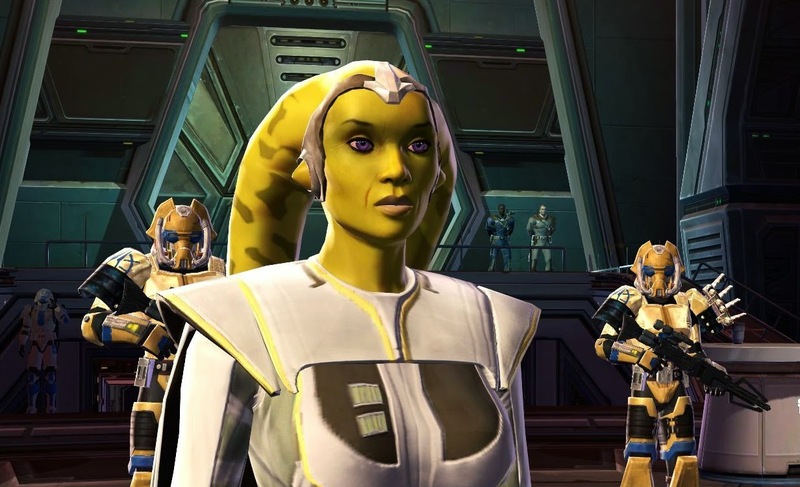 blogger lie about demise of swtor - Any rumours of SWTOR's demise have been greatly exaggerated. I've been playing since launch and it's clearly still around. happy birthday to me swtor - Yes, it's what the droids say. Ever since I saw this video, I keep hearing it in the background in various Republic bases and it drives me nuts! shop clues offers for makeb box eye shades - I see Makeb in there but other than that I have no clue what you're talking about. Box eye shades? swtor buttocks - Yes, if you like round, shapely buttocks you are playing the right game. swtor coaching newbies through ops - I just wanted to say that I'm delighted that this is something that people find important enough to google it. Keep up the good work! thana vesh killed me and i can't find her again - I'm sorry, but that's just embarrassing. First, congrats on the milestone! I find it hard to come up with the time to sit down and write blog posts myself! Great to see you going strong! "how can i tell how manny datacrons ive got so far in swtor?" The easiest way,as you mentioned, is looking up Codex entries. If you are only worried about your primary stat, you can look at the stat boost you have without armor and buffs. It should correspond to the aggregate datacron boosts. Counting the total stat boost without anything is useful if you can't remember if you grabbed the fleet datacron! Omg, these were so brilliant, you had the boyfriend and I laughing out loudly behind our computer screens there! Out of pure curiosity: how do you get to see all those search terms? On Blogger, I only get to see the last ten per day/week/month or all-time. Or do you write them down over the course of writing the next set of 100 posts? Glad you enjoyed them. :) The search terms are all from Google Analytics. Congratulations on 400 posts!!!! That is EPIC!!!! I think I am sitting at like seven right now. How do you get Google Analytics? I have just had to guess what was being searched based upon what views I receive (my Juggernaut Tanking Guide and Keybinding posts seem to be my most popular). Now that I have a link to my blog set in my SWTOR forums signature, most of my hits seem to come through that. Also, Ravanel, I have heard you mention your blog roll and adding different blogs to it. How would you do that? On Wordpress I can see all those that I follow in my reader view, but yours and Shintar's I have had to save as favorites in my browser. I know roughly when you tend to post, so I come by and check on those days. Anyway, I look forward to your next 400 posts, Shintar, keep up the good work!! To use the basic features of Google Analytics, you just have to go here and log in with a Google account. I seem to remember that you have to paste some code onto your blog as well to make sure everything gets tracked... it's been a while since I originally set the whole thing up. Thanks for the info. I do most of my blog reading on my phone so it seems I will just have to continue reloading your and Ravanel's pages. No biggie! I went with Wordpress because I saw XamXam and Heather (PLS) on it so started mine there. Found yours and Ravanel's after the fact. Also, there is an app that you can use to track your datacrons. It will allow you to include your alts as well, but I think it only goes up to Corellia. The best way to see if you have the Fleet Datacron I've found is looking at your secondary stat; at level 60 with all Datacrons and all buffs it should be 174. Presence is another easy stat to gauge by but that's only if you have the Presence boost from a Level 50 Human and all companion conversations completed; maximum with all datacrons is now 1,045. Sadly, no easy way to do it without other factors. Regardless, fantastic stuff, and sincerest congratulations on making 400 posts! Thank you! Those numbers are useful, I'll have to remember to come back here when I'm checking up on another character. The biggest problem with comparing stats for the fleet datacron is that it's hard to be sure what the numbers should be if you do or don't have it. What exactly do you consider a class's secondary stat btw? A class's secondary stat is, by my understanding, essentially what the main stat is of the other class which has access to either Tech or Force bonus damage, as that will in turn factor into their own Tech/Force bonus damage. Congratulations! Great blog! I've only been playing SWTOR for a few weeks and I'm really enjoying it. I had one comment on the "Affection" question above...I've actually had a few instances where I've gotten affection with two companions at the same time (in my case Corso and Bowdaar). I've never run a Flashpoint so it wouldn't have been because of that. It always happened when my suave Smuggler decided to help out one of the lovely alien girls. Glad to hear you're enjoying the game! There are some occasions where you can gain affection with multiple companions at once, which is when they are all present - which is usually on your ship. In a mission summary (where you collect your reward after completing a mission) you can also see gains from multiple companions sometimes, if you had different ones out at different stages of the quest.